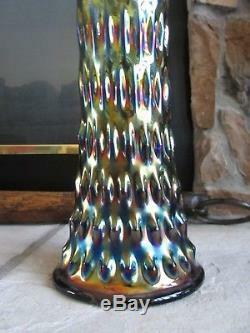 Presented here for your consideration is this SPECTACULAR "TRUE ELECTRIC" Early Period Carnival Glass Vase...... 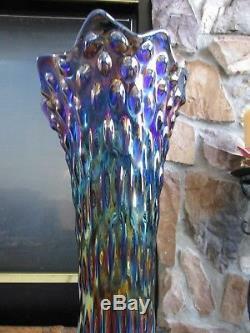 If you are a true Collector of exceptional early period Carnival Glass, this is the one you have been waiting for. Condition and Iridescence as well as Shape and Color are some of the elements that makes a piece valuable and this one listed here meets all these standards. 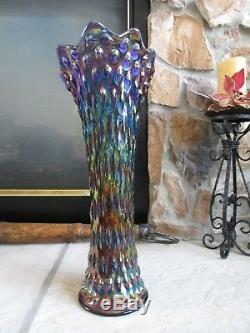 Made by the Fenton Glass Company in their RUSTIC line of Vases, the most valuable of all sizes is the "FUNERAL" Vase. The piece listed here shows a 5 1/4" base and stands 18 3/4" high with a 7 1/2 opening from the diagonal front to back high point. Featured in the "Blue" base glass color the ELECTRIC with the most vivid and brilliant hues of colors that dances around like "FIRE". 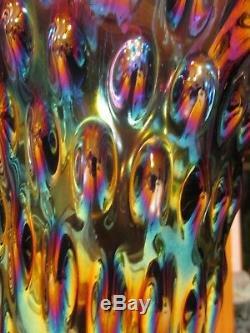 The finest iridescent finish I have ever seen. If there are also images of other examples they are listed separately on my site so please checkout my site for other Fine Antiques, Decorative Arts and Collectibles and other Fine Vintage Costume Jewelry. Condition: Very Fine Condition with NO flaws to report other than the usual Manufacturing Straw Marks on the Base and some on body as well as elongated air bubbles within the base of the glass and other areas within the Vase and an open air bubble on one of the hobs four rows up from the bottom please see image #9, it measures about 1/4" long by 1/8" wide and has a rounded hollow inside which is indicative an an "open air bubble". 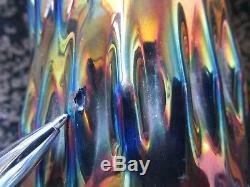 I have shown a close-up of the foot where the Iridescent spray did not completely cover the rounded edge and is not wear but done in the manufacturing process. There are NO flea bites, chips, cracks or repairs. I accept ALL MAJOR CREDIT CARDS through my Merchant Account. I guarantee ALL MY LISTINGS as DESCRIBED. I strive towards 100% Satisfaction with all my buyers. Fortunately, this does not happen very often, but if it does I always guarantee my items as described. 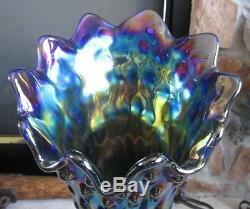 Thank You for taking the time to read my listing and look forward to eBaying with you. 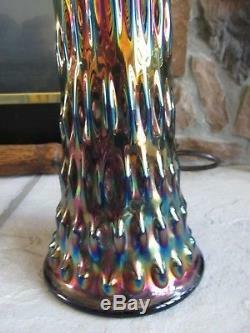 The item "Fenton Rustic FUNERAL VASE Carnival GlassELECTRIC Finest Iridescence" is in sale since Sunday, December 17, 2017. 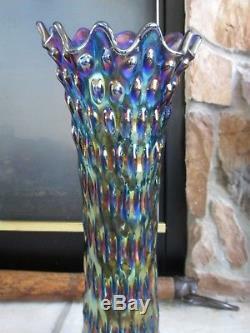 This item is in the category "Pottery & Glass\Glass\Glassware\Carnival Glass\Vintage (Pre-1940)\Fenton". 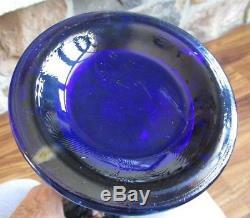 The seller is "kandinsky55" and is located in Fort Madison, Iowa. This item can be shipped to United States.